A no-brainer for keeping your tone intact with long cable runs. Saves your tone on long cable runs. Price. Connection options. 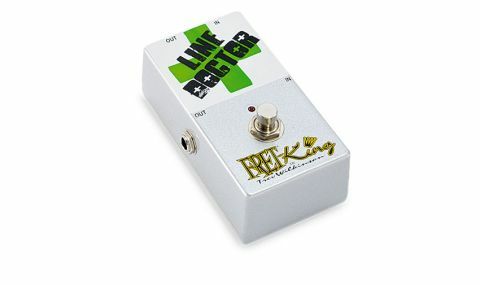 The Fret-King Line Doctor, part of the firm's first stompbox range, has no sound of its own, but is designed to 'heal' your tone if it degrades - usually the consequence of using long cable runs and/or a series of 'true bypass' pedals. "The Line Doctor does a great job at the front of our signal chain, delivering a significantly brighter signal"
Most manufacturers offer true bypass these days: the feature is seemingly a must-have for many purchasers, but a chain of them can suffer from signal degradation, notably a reduction in high frequencies due to issues that we don't have the space to discuss here. The Line Doctor provides buffering to counteract that. In a test setup with four true bypass pedals and average cable lengths, the Line Doctor does a great job at the front of our signal chain, delivering a significantly brighter signal, but it could work at different points in a chain, not least your effects loop. While its footswitch is, to a certain extent, superfluous (a buffer should be an always-on device) it usefully lets you A/B and hear the effect that the pedal is having. And that effect is all good!